The buildings in the village are constructed mainly from volcanic material. The paving slabs and the street furniture in the old town are made from basalt, the rock that is formed when lava cools. 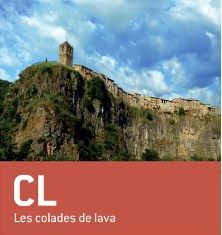 A 40-m high basalt cliff formed by two lava flows originating from volcanoes in Olot and Begudà. The morphology of the basalt depends on how the lava cools: columns and slabs. The old town dating from the Middle Ages, with buildings constructed from volcanic rock, narrow streets with small squares and viewpoints. Old church-museum: cultural centre with temporary exhibitions and a panoramic view from the bell tower of the old town centre and the Fluvià valley. Industrial architecture along the riverside. Industrial use of water: dams, canals and mills. Access: Natural Park Itinerary 13 (1,5 km, 40 min), begins at the car park at the junction of the N-260 and the road to Oix. Braille signage from different points of tourist interest that make up the circular route that allows you to walk the streets of the old town to reach the viewpoints of the basaltic wall and visit the old church. This route follows some of the old paths and trails used to bring wood charcoal down from the Serra de Finestres. The path that passes by Font Ricard is an attractive mule trail that connects the hamlet of Ruïtlles to the church of El Freixe. This route allows you to discover one of the least known but most interesting areas of La Garrotxa Volcanic Zone Natural Park, walking between forests and farmhouses. Les Planes d’Hostoles is well known for its natural bathing pools that have been used in numerous films and adverts. This is one of four suggestions. The recreational area of Xenacs in Les Preses provides an atypical view of La Garrotxa and is one of the best places anywhere for getting a bird’seye view of Croscat and the other volcanoes in the area. As well, the height makes it an ideal place. Located on the tip of a large cliff, with wide views of all directions, it provides the name lighthouse without a doubt, the Far Sanctuary is one of the places of greatest visibility of the country. This route is an agreeable stroll through the shady woods of Clot Mal, a stream that runs down from the western side of the slopes around the church of Freixe. This itinerary passes near a spectacular basaltic cliff, not only for its height, but also for the houses built right on its edge.